The better hook here is “which is the better deal?” That’s a hook that strikes up argument and debate, the answer to which is ultimately, “It depends.” The best visual would be a screen capture of the websites of two competing companies offering these kinds of plans. The visual here reveals the answer to the hook. It clearly shows the ball clearing the net. 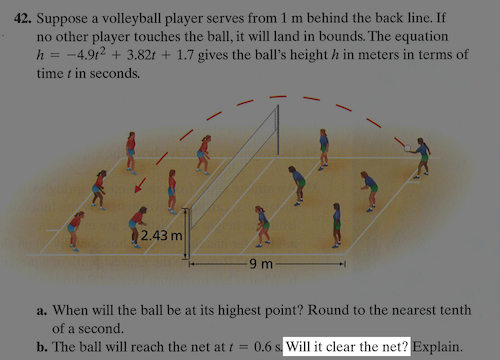 The better visual would encourage students to guess whether or not they think the ball will clear, following which they’d calculate the answer to see if they were right or wrong. This is a strange hook. How high the ladder is off the ground is a far less compelling matter than “will the ladder reach high enough to save the old man and his grandson?” Is it possible to film or photograph something that would urge that question? Or would that be totally illegal? The hook here is backward. No patrolman comes to the scene of a wreck knowing exactly how fast the cars were traveling, wondering how long the skid marks are. The patrolman can measure the skid marks. He wants to know how fast the cars were moving. 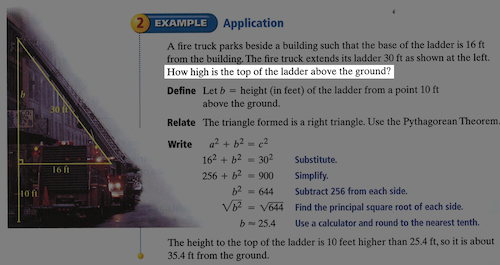 Ideally, the visual would allow students to inspect the skids and guess their speeds. The hook is obvious here, at least. The visual, ideally, would be a video of the scene that would help students get a sense of the individual speeds and then make an informed guess about their combined speed.